12 • April 2018 • S I G N & D I G I T A L G R A P H I C S Stratacache Completes Scala Acquisition Dayton, Ohio-based Stratacache, a digital signage and content distribution solutions provider, announces that it has completed the acquisition of all outstanding Scala shares and Scala divisions around the globe, including Scala Inc., Scala BV, Scala KK and Scala Nordic AS. The company says the acquisition will foster further growth for Scala globally, providing access to Stratacache resources and tech- nology platforms as well as setting the stage for future acquisitions into the Scala brand. "Scala has created an excellent brand and execution footprint around the globe over the past thirty years, tailoring their digi- tal signage offerings to the specific needs of each global region. Strategically expanding that growth with the full backing of Stratacache support, services and capital will help grow Scala to the next level," says Chris Riegel, CEO of Stratacache. "After great growth of Scala in 2017, we are making it clear that the Scala brand is part of the Stratacache family of digital media and marketing technology companies, and with that comes the unique ability to leverage the greater platform—including software, hardware, ser- vices and support—to serve lead- ing global brands." 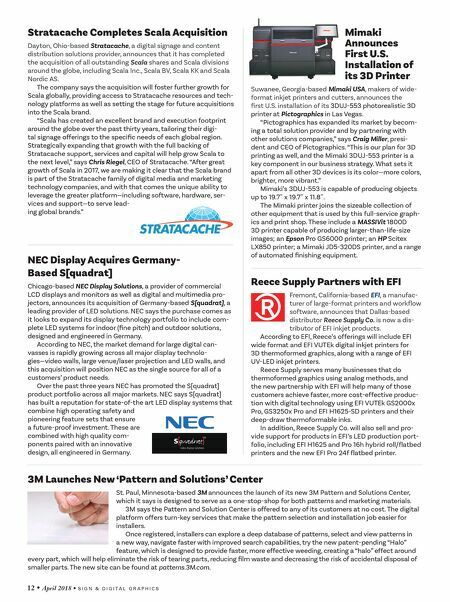 NEC Display Acquires Germany- Based S[quadrat] Chicago-based NEC Display Solutions, a provider of commercial LCD displays and monitors as well as digital and multimedia pro- jectors, announces its acquisition of Germany-based S[quadrat], a leading provider of LED solutions. NEC says the purchase comes as it looks to expand its display technology portfolio to include com- plete LED systems for indoor (fine pitch) and outdoor solutions, designed and engineered in Germany. 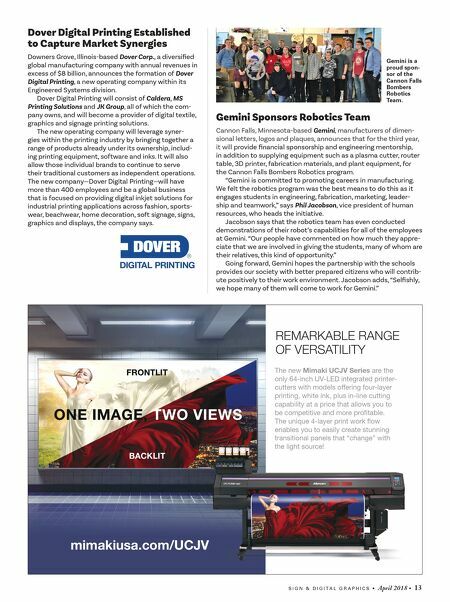 According to NEC, the market demand for large digital can- vasses is rapidly growing across all major display technolo- gies—video walls, large venue/laser projection and LED walls, and this acquisition will position NEC as the single source for all of a customers' product needs. Over the past three years NEC has promoted the S[quadrat] product portfolio across all major markets. NEC says S[quadrat] has built a reputation for state-of-the art LED display systems that combine high operating safety and pioneering feature sets that ensure a future-proof investment. These are combined with high quality com- ponents paired with an innovative design, all engineered in Germany. 3M Launches New 'Pattern and Solutions' Center St. Paul, Minnesota-based 3M announces the launch of its new 3M Pattern and Solutions Center, which it says is designed to serve as a one-stop-shop for both patterns and marketing materials. 3M says the Pattern and Solution Center is offered to any of its customers at no cost. The digital platform offers turn-key services that make the pattern selection and installation job easier for installers. Once registered, installers can explore a deep database of patterns, select and view patterns in a new way, navigate faster with improved search capabilities, try the new patent-pending "Halo" feature, which is designed to provide faster, more effective weeding, creating a "halo" effect around every part, which will help eliminate the risk of tearing parts, reducing film waste and decreasing the risk of accidental disposal of smaller parts. The new site can be found at patterns.3M.com. Mimaki Announces First U.S. Installation of its 3D Printer Suwanee, Georgia-based Mimaki USA, makers of wide- format inkjet printers and cutters, announces the first U.S. installation of its 3DUJ-553 photorealistic 3D printer at Pictographics in Las Vegas. "Pictographics has expanded its market by becom- ing a total solution provider and by partnering with other solutions companies," says Craig Miller, presi- dent and CEO of Pictographics. "This is our plan for 3D printing as well, and the Mimaki 3DUJ-553 printer is a key component in our business strategy. What sets it apart from all other 3D devices is its color—more colors, brighter, more vibrant." Mimaki's 3DUJ-553 is capable of producing objects up to 19.7˝ x 19.7˝ x 11.8˝. The Mimaki printer joins the sizeable collection of other equipment that is used by this full-service graph- ics and print shop. These include a MASSIVit 1800D 3D printer capable of producing larger-than-life-size images; an Epson Pro GS6000 printer; an HP Scitex LX850 printer; a Mimaki JD5-320DS printer, and a range of automated finishing equipment. Reece Supply Partners with EFI Fremont, California-based EFI, a manufac- turer of large-format printers and workflow software, announces that Dallas-based distributor Reece Supply Co. is now a dis- tributor of EFI inkjet products. According to EFI, Reece's offerings will include EFI wide format and EFI VUTEk digital inkjet printers for 3D thermoformed graphics, along with a range of EFI UV-LED inkjet printers. Reece Supply serves many businesses that do thermoformed graphics using analog methods, and the new partnership with EFI will help many of those customers achieve faster, more cost-effective produc- tion with digital technology using EFI VUTEk GS2000x Pro, GS3250x Pro and EFI H1625-SD printers and their deep-draw thermoformable inks. In addition, Reece Supply Co. will also sell and pro- vide support for products in EFI's LED production port- folio, including EFI H1625 and Pro 16h hybrid roll/flatbed printers and the new EFI Pro 24f flatbed printer.